The traditional lines of this tennis shoe are enhanced by a leather-based upper and the durable comfort of ASICS GEL Cushioning System. 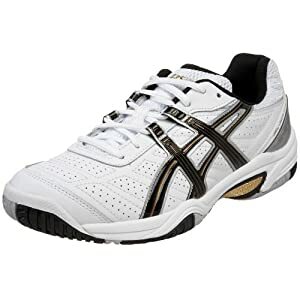 The Asics Gel Dedicate offers legendary Asics Gel cushioning in a lightweight, leather upper tennis shoe. Asics Gel Cushioning System attenuates impact shock. Great comfort at a great value!Color: White/Black/GoldGEL Cushioning System in forefoot-Attenuates shock during impact and toe-off phases.Leather upper.Average weight: 13.1 oz (Mens 10.5)Leather upper.